With the Dutchman at the heart of their defence, the Premier League leaders have conceded just seven goals in 19 matches so far. Virgil van Dijk (file pic). 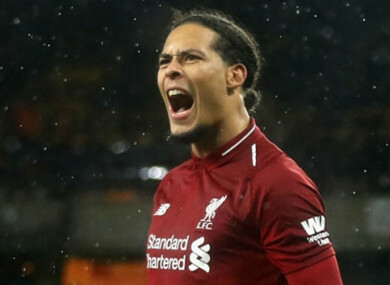 VIRGIL VAN DIJK is proud of Liverpool’s exceptional defensive record this season but insists that he is not the reason for the Reds’ improvement. Van Dijk has been in fine form for Jurgen Klopp’s side this term and his dominant performances have helped the league leaders go unbeaten in the opening half of the campaign, conceding just seven goals. And, in an article on Liverpool’s website to mark a year since the Dutchman’s arrival from Southampton for a world-record fee for a defender of £75 million, Van Dijk has expressed his pride following a superb 12 months at Anfield. “Our defensive record this season has been spoken about a lot and I’m definitely proud of it,” Van Dijk wrote. “The entire team has contributed towards it and we should all be proud of the fact we’re trying to keep clean sheets, not only the defence. “Everyone has done their bit. We all do it together. Everyone is a big part of the records we’ve set. We all do it together and that’s something to be proud of collectively. Setting club records is very, very nice and something to stimulate everyone else to keep going and not be satisfied with what we have right now. Van Dijk has been hailed as the player who has solved Liverpool’s defensive problems and the 27-year-old accepts that, had the Reds’ frailties remained, he would have come under scrutiny. “It’s very important to me all the lads get the recognition,” he continued. “When things are going well people will probably say that I am the one that changed things, but it is not like that. Liverpool sit six points clear at the top thanks to a 4-0 win over Newcastle United on Boxing Day, though their title chances could be put to the test when they host Arsenal on Saturday, before facing champions Manchester City on 3 January. Murray Kinsella, Gavan Casey and Andy Dunne look back on a memorable year for Irish rugby. Email “Van Dijk proud of record-breaking Liverpool defence”. Feedback on “Van Dijk proud of record-breaking Liverpool defence”.